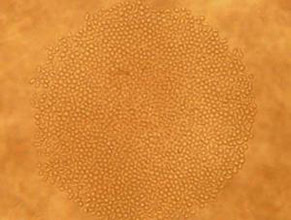 Although all the cells in a colony of blood cells may look alike, they may have different functions. Tools to track and analyse individual stem cells within a cell population like this can help us better understand how the blood system works, and may have implications for cancer research. Stem cells are special cells, essential for the maintenance and repair of all our organs, but they are rare and do not look obviously different to other cells. Tests to demonstrate stem cell function typically destroy the original cell. This means researchers can’t directly compare the molecules that operate in a stem cell to other, similar cells. It also makes it difficult to develop protocols where stem cells are manipulated to produce clinically useful cells outside of the body. In a study published in Cell Stem Cell, Professor Bertie Göttgens and colleagues at the Cambridge University Department of Haematology, the Cambridge Institute for Medical Research and the Wellcome Trust/Medical Research Council Stem Cell Institute use for the first time a combination of single cell biology tools to define the molecular signature of functional blood stem cells. 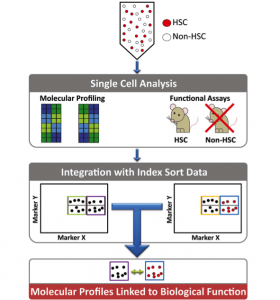 Single cell biology tools are tools and technologies that allow researchers to track and analyse individual cells within a cell population. The researchers isolated single cells from rare populations in the bone marrow that are enriched for blood stem cells using flow cytometry (a technique that fluorescently labels proteins on the surface of a cell and separates the cells into positive and negative fractions). They profiled the genes these single cells express, and tested the cells’ transplantation capabilities. Next, using advanced cell sorting and computational biology approaches, they were able to define the genes present in the single blood stem cells that were capable of creating a new blood system upon transplantation, by comparing them to single cells that were unable to do so. The new study is truly interdisciplinary, using many different single cell technologies, including genetic sequencing and single cell culture and transplantation models. Dr Florian Büttner from the Helmholtz Institute in Munich, developed new computational analysis tools that made the integration and analysis of these complex datasets possible. Work in the Göttgens Lab is supported by Leukaemia and Lymphoma Research; Cancer Research UK; the Kay Kendall Leukaemia Fund; the NIHR Cambridge Biomedical Research Centre; the Leukemia & Lymphoma Society of America; the UK Medical Research and Biotechnology and Biological Sciences Research Councils (MRC and BBSRC); and core support grants by the Wellcome Trust to the Cambridge Institute for Medical Research and Wellcome Trust-MRC Cambridge Stem Cell Institute.